Performers include: Ben McKenzie, Erin Richards, Donal Logue, David Mazouz, Jada Pinkett Smith, John Doman, Camren Bicondova, Robin Lord Taylor, Cory Michael Smith, Zabryna Guevara, Victoria Cartagena, Andrew Stewart Jones, and Sean Pertwee. Based on characters from the Batman comic books, this dark crime drama tells the early stories of iconic characters, before they became legendary crimefighters, villains. and vigilantes. 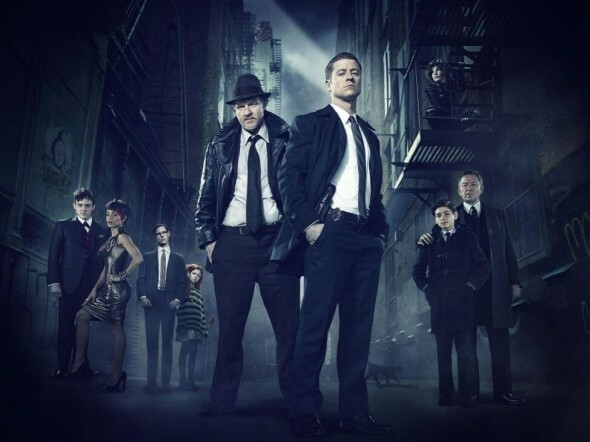 Growing up in Gotham City’s surrounding suburbs, James Gordon (Ben McKenzie) romanticized the city as a glamorous and exciting metropolis where his late father once served as a successful district attorney. He’s two weeks into his new job as a Gotham City detective and he’s engaged to his beloved fiancée, Barbara Kean (Erin Richards). Gordon is living his dream but hopes he can restore the city back to the pure version he remembers it was as a kid. Brave, honest and earnest, the new detective is partnered with the brash, but shrewd police legend Harvey Bullock (Donal Logue). The two end up stumbling upon the city’s highest-profile case — the murder of local billionaires Thomas and Martha Wayne. At the scene of the crime, Gordon meets the crime’s sole survivor; the Waynes’ intense 12-year-old son, Bruce (David Mazouz). Gordon feels an inexplicable kinship to Bruce and, moved by the boy’s profound loss, Gordon vows to catch the killer. As he navigates the often-underhanded politics of Gotham’s criminal justice system, Gordon confronts imposing gang boss Fish Mooney (Jada Pinkett Smith) and mob kingpin Carmine Falcone (John Doman). He also encounters unusual characters who will end up becoming some of the city’s most feared villains — future Catwoman, teenage Selina Kyle (Camren Bicondova); The Penguin, Oswald Cobblepot (Robin Lord Taylor); and The Riddler, Edward Nygma (Cory Michael Smith). The story follows Gordon’s turbulent rise through the Gotham City police department, led by Police Captain Sarah Essen (Zabryna Guevara). He goes head-to-head with major crimes unit detectives Renee Monyoya (Victoria Cartagena) and Crispus Allen (Andrew Stewart Jones). It also focuses on the unlikely friendship that Gordon forms with the young heir to the Wayne fortune. Bruce is being raised by his unflappable butler, Alfred Pennyworth (Sean Pertwee). It’s a friendship that will last all of their lives and will play a crucial role in helping the young boy eventually become the famed cape crusader that he’s destined to be. What do you think? Do you like the Gotham TV show? Do you think it should be cancelled or renewed for another season? I love this show, my favorite. Fox always cancels tv shows I like. So please keep it going. Time to go episodes getting monotonous. Gordon an oaf constantly getting beat up seems to never learn making same senseless mistakes eternally. Reincarnated characters that should just die and bringing new villans. Lost interest in show liked in the first few seasons. Gotham is the best show on TV and I hope it continues. The story line can go on for years if they want it to. Two more episodes left. Series has been cancelled. Hope it gets picked up by another network, but not holding my breath. Here’s hoping the show lasts another 5 seasons. The original series in the 60’s would tilt the camera to depict the strangeness of the scene, here every camera angle does the same and more! It’s twisted violence is enthralling. Easily the best cast on TV. I really enjoy this. In the UK this type of programme is sadly not really made, of course we still have Dr. Who!! Please don’t cancel this show. Its awesome. are you sure about the ratings? The fact that characters were evolving was awesome. Can you deny the Penguin, Joker, Riddler and Catwomen story lines were awesome to follow? I really looked forward to the show weekly. Now… season finale.